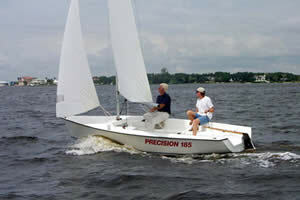 I (Jib Height) 18.70 ft.
J (Jib Width) 6.10 ft.
E (Mainsail Width) 9.00 ft.
P (Mainsail Height) 21.50 ft.
at Seat Height 100 in. Main Halyard 5/16 in. - 52 ft. Spare Halyard (Dealer Option) 5/16 in. - 41 ft.
Main Sheet 5/16 in. - 32 ft.
Jib Sheet (2) 1/4 in. - 26 ft..
1/4 in. - 5 ft..
Cntr Bd Line #1 (Spectra) 1/8 in. - 5 ft.
Cntr Bd Line #2 (Dacron) 1/8 in. - 10 ft. Rudder Line 3/16 in. - 5.5 ft.
Boom Vang 1/4 in. - 14 ft.
Jib Furling Line (Low Strech) 5/32 in. - 18 ft.
Uppers 1/8 in. 1 X 19 18 ft. 8.5 in. Lowers 1/8 in. 1 X 19 9 ft. 2.0 in. Mast 24 ft. 7 in. Boom 9 ft. 5 in. Spinnaker Pole 6 ft. .72 in. Width 88 in. 88 in. 88 in. Length 222 in. 222 in. 286 in. Weight 590 lbs. TBD. 990 lbs. Weight 880 lbs. TBD 1270 lbs. *NOTE: W/ trailer winch stand removed. *NOTE: W/ trailer tougue length included.